New with version 2.0 — the Noisy Bug Game! Take the challenge: learn the bug sounds and match the sounds (and sound waves) with the correct bug! Kids are fascinated by bugs. And bugs ARE fascinating! 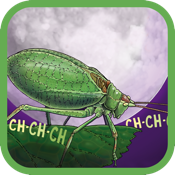 This interactive app both entertaining and highly educational, a wonderful introduction to the busy, noisy world of insects. This indoor activity can go outdoors! It will encourage the scientist-child in your life to get out and observe nature closely. Bugs don’t have vocal chords. They don’t use their mouths to make sounds. Instead they move different body parts to make those sounds. Touch the bug and see what it does to “sing.” Crickets! Cicadas! Beetles! Katydids! Grasshoppers! Each makes a unique sound in a unique way. Your kids will soon be singing like bugs! Here is an ideal way for the whole family to have both outdoor and indoor fun by listening to bugs, imitating them, and identifying them. This interactive app is based on the best-selling book of the same name, written and illustrated by a bug expert and published by a company dedicated to encouraging kids to appreciate nature. Children will see and hear insects as they actually move their bodies to make sounds – all kinds of sounds. * Touch the bugs or jiggle the screen to watch them move their bodies in the way that they produce sounds! Remember, insects do not create sounds through vocal chords, but by moving other body parts. * Hear actual recorded insect sounds. * Have fun with onomatopoeia – sing along with the author as he imitates the bug sounds. * Includes interesting extra information about each featured species. * All information is scientifically accurate. The author is an expert on insects. From School Library Journal (book review): "A still summer evening isn’t always quiet for those who listen carefully. They might hear and identify some noisy bugs using this simple primer. Himmelman devotes a spread to each insect and its distinctive sound. Though the text is simple, with just one line per page, the author packs in the information. He includes the complete name of the bug and an easy-to-replicate phonetic description of the sound. Readers will also learn about how the noisy creature adapts to its environment. For example, a Dog-Day Cicada buzzes high in a tree, not near the ground. The textual information is set off by larger-than-life illustrations. The colors are saturated but still realistic. There are enough details in the pictures to serve as a beginning identification guide. Additional details about all of the bugs is appended. Nature activities are included. This book will be well-used on trips to the woods and in backyards throughout the summer, wherever noisy bugs can be found." Dawn Publications is dedicated to inspiring in children a deeper understanding and appreciation for all life on Earth.